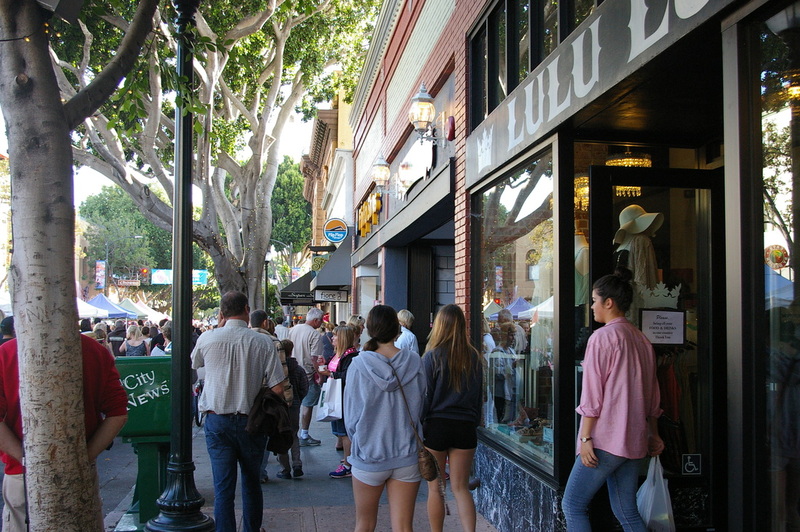 Embraced by seven ancient Morros marching to the sea, with fertile green valleys between; embellished by a sparkling creek rushing through its center, and blessed with a sun-kissed climate, downtown San Luis Obispo has irresistible charm. And its residents strive to preserve these unique natural characteristics. But the ambiance we cherish derives not only from its geographical beauty, but also from Downtown’s diverse historical elements, the still-discernible presence of its first inhabitants, the Chumash Native American tribe who lived here long before the others arrived. Here also, evidence of the Spanish missionaries, the Chinese-Americans, and European-Americans abounds. Juxtaposed against the bucolic flavor of our rural surroundings, is a thriving downtown with unique specialty shops, creek side restaurants, and boutique clothing stores. With countryside visible from every corner, there is a feeling of being in the country, while also being downtown, where contrasting urban and rural environments happily co-exist. Chain stores have invaded, yes, but it is the small, locally-owned chocolatiers, clothiers, toy makers, bead shops, galleries, and hand-crafted jewelry stores; bohemian coffee shops, garden patio eateries, saloons, and bakeries that make Downtown a joy to visit – and often. Where most communities the size of San Luis Obispo proliferate with mid-rise and high-rise buildings, our Downtown consists predominantly of two- or three-story buildings. Prestigious national surveys, and even Oprah herself, have declared that San Luis Obispo is an unusually “healthy” and “happy” place. Designed with numerous plazas, courtyards, walkways, and alleys, Downtown encourages conversation among friends and strangers alike. Whether at a fashionable wine tasting emporium or deep inside the infamous Bubblegum Alley, the city fosters those small encounters that don’t happen just anywhere. And it doesn’t hurt that the students from our two colleges add to our cultural ferment by infusing it with their youthful vitality and fresh ideas. Downtown San Luis Obispo honors a past rich in vigorous civic experiences. Anchored by the white-washed Mission built by Spanish missionaries and their Chumash neighbors, our compact Downtown enjoys the shade of leafy trees planted by the gateway effort of the venerable Monday Club. Memory Walks, complete with narratives and archived photographs produced by the History Center tell tall tales of the town’s early days. Historic homes like the stately Dalidet Adobe and the proud Victorian-era Jack House are downtown landmarks honored by Obispo Beautiful’s initiation of a plaque system. Finally, San Luis Obispo’s civic experience is nowhere more evident than through the efforts of Save Our Downtown. Provoked by the delisting of the historic Lubliner Building; the proposed demolition of the Frietas Adobe; the construction of a the too-tall Palm-Morro Street parking garage; and by the proposed 75-foot high Chinatown and Garden Street Terraces projects—Save Our Downtown is currently engaged in reviving a badly needed Downtown pedestrian plan. S.O.D. strives to revise the Downtown Concept Plan and participate on the Citizen’s Advisory Committee for the Land Use and Circulation Element Update. For starters, a strong and thriving downtown will also require more retrofitting—of the Granada Hotel and the Garden Street historical buildings. What is Downtown San Luis Obispo’s future? Our future lies in creating a true downtown neighborhood where, in addition to the Wineman and Anderson buildings, more residents of greater diversity live downtown. Save Our Downtown wants our future to be based on continuing tolerance of progressive, innovative ideas where we promote the exchange of locally-grown, locally-manufactured goods. We continue to promote a Downtown where all people feel welcome: people of all ages, races, and creeds. We wish to encourage the vigorous expression of the arts. “SLOTOWN” is the rallying cry of a city that resists the civic homogenization that can turn any town into every other town. Today, our downtown is creative and fun but if not checked, it could grow so fast as to become big and bland. Let’s please value our downtown’s continued and unique vitality – a vitality that, in terms of its architecture and civic structure, is rooted in the past but flourishing in the present. We are concerned about the growing concentration of alcohol outlets Downtown. This is for three reasons. For every additional alcohol outlet there is one less retail shop downtown and so goes retail diversity. The concentration of alcohol outlets along Higuera Street discourages window shopping. And finally we are concerned with the negative impact alcohol-related crime has on downtown businesses and downtown residents.